Unique Mother’s Day gifts, that’s what we want! My husband recently asked me what I would like for Mother’s Day this year. I’m a pretty simple girl, I don’t wear much jewelry or makeup and my wardrobe is pretty much the same week to week. I’m lots of fun though, really, I swear!?! Unique gifts are my thing, gifts that are out of the norm but practical and useful. Perhaps this is why he’s looking for suggestions. Some things that came to mind – wine tap, well behaved kids, Caribbean island to myself, etc. Hey, I may be simple but I’ve got dreams just like the rest of you. Keeping this list in mind, I’ve compiled a list of my “go to” websites for unique gifts along with a few other suggestions, things that would make any mom happy. Seedles – I recently discovered Seedles. 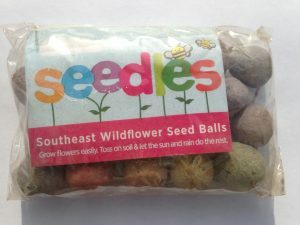 Seedles are flower and herb seed balls. They can either be planted or just thrown on the ground. After just a bit of time, you’ve got flowers and herbs growing. I have a spot in my yard that’s just weeds, I can’t wait to plant the flower seed balls and having wildflowers burst out. Seedles’ goal is to grow wildflowers in support of the declining bee population. For Mother’s Day, they are including a free postcard with every order, placed by May 9, 2017. To read more about the importance of wildflowers and bees, click here. 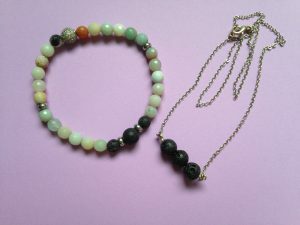 Reuseit.com – This is one of my most favorite websites for environmentally friendly gifts. They have all sorts of reusable products for many aspects of your life. Many of the products replace disposables you may be using so not only are you giving a useful gift, but you’re giving a gift that will help our environment. I’ve ordered many things from Reuseit and have been happy with everything. To read more about the impact of reusables, click here. UncommonGoods.com – Uncommon Goods is my go to at holiday time. I’m usually at a loss for gifts for a few people on my list and can always count on Uncommon Goods to spark some ideas. They have all kinds of cool, unique, quirky and sometimes downright silly gifts. I love their story, they work with their artists to use recycled and sustainable materials whenever possible and minimize their environmental impact with respect to packaging and catalogs. You can read more about the company and the artists they buy from, on their website. Aroma Couture Jewelry – Aroma Couture came in to my life last year and I fell in love with their jewelry. I know, I said I don’t wear much jewelry but as I started to incorporate more essential oils (EO’s) in to my life, I found that wearing EO’s provided great benefit to my mood. When I saw the lava rock bracelet, I knew I had to have it. I can put a drop of oil on the rock(s) and the scent gives my mood a boost, well, depending on which oil I use. Check me out, I’m a perfume maker! Norwex (www.heathercates.norwex.biz – I’m a Consultant, I will be financially compensated for any purchase from this website. I love the Norwex mission (improving quality of life by radically reducing chemicals in our homes) and their products are top notch. Many of the Norwex products are used for cleaning however, there are also many personal care products. Make every day a spa day for mom with the Norwex Body Scrub Mitt, Relaxation Gel and Shower Gel. Let her sleep in and take a long, relaxing bath. While she’s doing that, her husband and kids can clean the car. Invest in the Car Cloth, Car Wash Mitt and the 3-in-1 Car Mitt and she can have a clean car at a moment’s notice. 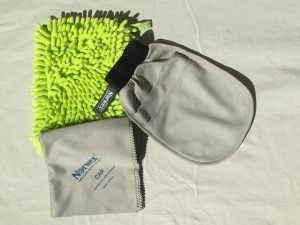 With Norwex microfiber, all you need is water so you can get the kids involved without worrying about harsh chemicals. OrganicBouquet.com – Years ago when my daughter was born, several of my friends sent me a bouquet of roses from this website. The flowers were gorgeous, stayed fresh for quite a while and the best part, the flowers are grown in an environmentally friendly manner that also provides great resources for the farm workers and artisans. You can learn more about their commitment to our environment on their website. A couple years ago, I was working at a local plant nursery on Mother’s Day. I got to chatting with a customer, she was telling me about her family’s Mother’s Day tradition. The family took her to brunch and afterwards, they stopped by the plant nursery and she picked out the flowers/plants she wanted in the garden and then the husband and kids did all the planting. What a genius idea! She always gets what she wants for Mother’s Day and her family doesn’t have to worry about getting something she won’t like. You may be wondering about my response to my husband’s question. I would like a home cooked dinner. That is all. Let’s make this the year of “DIY”. My daughter is the crafty one in the family so she’ll probably work her magic and make a card for me. Unique Mother’s Day gifts can make mom feel special however, handmade is always sure to make her loved, especially with young kids. My son’s lacrosse season is finishing up, it’s tournament weekend (a win on Mother’s Day would be a great gift) so making any plans is hard but surely my dear husband can put together dinner. It’s not often that he cooks but when he does, he does a great job. And that would be the perfect Mother’s Day gift for me! One of my favorite things to get for my mom is hanging baskets and flats of flowers for her garden. It’s something she would buy for herself, but won’t have to worry about it. What a great idea! Takes the guess work out and she’s happy. It’s a win win! Thank you! I just love the story behind the seed balls. My mom purchased some as well. I can’t wait to compare our gardens. I love handmade gifts too. Love the idea of taking my Mum to pick her own flowers and planting them for her, she lives her garden but doesn’t always have time to keep it up. These are awesome gifts. Love the post!